Umgeni Vlei Nature Reserve is one of South Africa’s smaller Ramsar wetlands with a total area of 958ha at the high altitude of between 1800m and 2100m. It consists of grasslands, a few small areas of scrubby woodland and most importantly, a diverse and extensive range of unmodified wetlands. The reserve is divided into 2 sections. The main area containing most of the wetlands and some pans is 470ha in size, with a grassland section of 488ha. The nature reserve takes its name from the uMngeni River as it lies within the catchment area of the river and forms an important source of the river. The name “uMngeni”, given to this river (which is sometimes spelled “Mgeni”, “uMgeni”, or “Umgeni”) is said to be derived from the isiZulu word for ‘river of the thorn tree’. “Vlei” is originally an Afrikaans term for a wetland, but has become an acceptable and commonly used South African English word for a stretch of low-lying ground that is either permanently marshy or is flooded in the rainy season to form a shallow lake. The nature reserve and the expansion area are in one of the best-watered, least drought-prone areas of the subcontinent. Rainfall varies between 980 - 1000mm per annum, with approximately 80% of the rain during summer months. Snowfalls occur mainly in winter, but may also occur in spring and autumn, with an average frequency of about eight days of snowfall per year. The Drakensberg generally and the nearby nature reserve and expansion area, experiences amongst the highest incidence of lightning strikes in southern Africa. The area around the nature reserve is designated as an Important Bird Area by Birdlife SA (SA075). This is one of the most important sites in South Africa for Wattled Crane. Up to ten pairs have nested in the main vlei and smaller vleis outside the reserve boundary. Breeding pairs of Grey Crowned Cranes and Blue Cranes are also present. The site has been little modified in the past, having been used only for cattle and sheep grazing. During 1987 the Natal parks Board (now called Ezemvelo KZN Wildlife) acquired the site in order to protect the Wattled Cranes. While specialist bird-watching opportunities are available, the area is not considered to hold significant potential for tourism, both because of the risk of disturbance to the Wattled Cranes during the breeding season, as well as problems related to difficult public access. The uMngeni Vlei Nature Reserve is situated enroute to the Drakensberg, approximately 22km South-West from Nottingham Road in Kwa-Zulu Natal. To reach uMgeni Vlei Nature Reserve is a special experience in itself. You cannot just drive there for a Sunday afternoon because the reserve is surrounded by private commercial cattle farms. First, you have to make an appointment with the Officer In Charge of the reserve who in turn will arrange the visit with the farmers. Then you must have a suitable vehicle because the roads leading to the reserve’s entrance and the roads inside the reserve demand a vehicle with good ground clearance, preferably a 4x4. 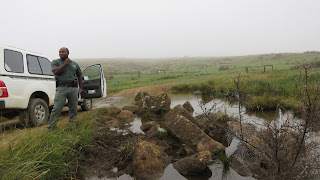 On a wet rainy day, it took us 30 minutes from the farm’s entrance to the border fence of the reserve, and a further 15 minutes to the reserve’s entrance. It was a misty, cloudy, rainy day when we visited Umgeni Vlei, as if the reserve wanted to hide itself from being seen and exposed. But now and again the clouds and the mist lifted, exposing this special Ramsar wetland with all its natural beauty just long enough for a glimpse and to take a few quick photos. 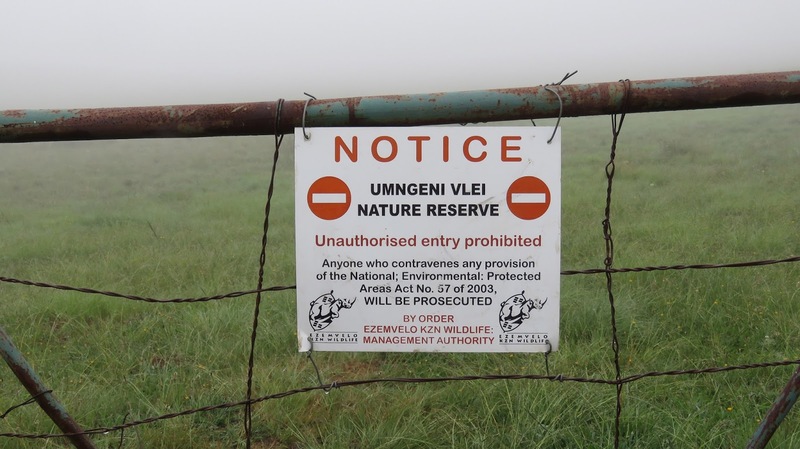 Umgeni Vlei Nature Reserve is owned and managed by Ezemvelo KZN Wildlife. There is a very good understanding and cooperation between park management and the surrounding landowners, presenting a win-win situation. All involved respect and want the special conservation status of the reserve. Fire management and control is of utmost importance to both parties and demands cooperation. Another area of cooperation is the introduction of controlled grazing inside the reserve for cattle from the neighboring areas. Cattle grazing facilitate the nesting of cranes by opening up the Vlei. This example of good cooperation can be credited to the enthusiastic, committed, positive attitude and integrity of the current Officer In Charge, Micca Khoza, and all the neighboring farmers, but specifically Chris Maloney of the farm Castle Howard. Well done to all of you. 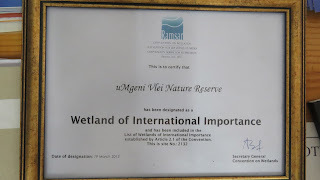 I wish that so many of the other Ramsar wetlands where cooperation is lacking, can learn from this. To the north west of the uMngeni Vlei Nature Reserve lays uMkhomazi Nature Reserve. 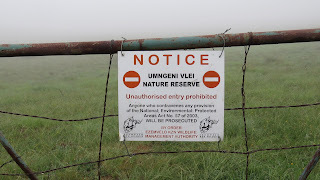 uMngeni Vlei Nature Reserve is managed from uMkhomazi and staff and budgetary resources are acquired from uMkhomazi Nature Reserve. Umgeni Vlei Nature Reserve is a very important catchment area of the uMngeni River due to its high altitude and good average rainfall. The uMngeni River supports two major cities in terms of water supply along its journey to the Indian Ocean, namely Durban and Pietermaritzburg. Dams constructed along its way include the Midmar, Albert Falls, Nagle and Inanda. Two critically endangered species, the Wattled Crane and Oribi antelope occur and breed inside the nature reserve and the expansion area. Wattled Crane conservation is a key function of the reserve. It is regarded as the premier site in South Africa for protection of this rare and threatened bird species. At times some 20% of the South African population of the species may be present in and around the nature reserve. 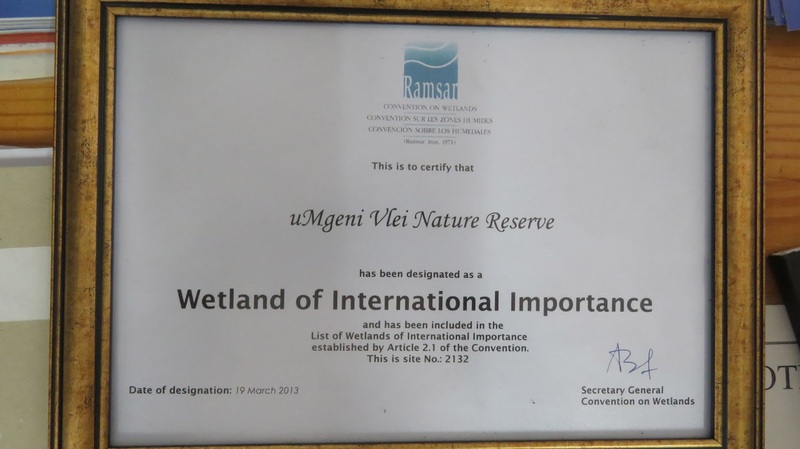 Ramsar status was bestowed onto the reserve on 19 March 2013. We also saw herds of Eland just outside the reserve on the neighboring farms. As visitors from outside KZN, it was a special sighting to see one of my favourite antelopes, the endangered Oribi. The water from the reserve is crystal clear with no pollution or contamination. But there are other threats and challenges. 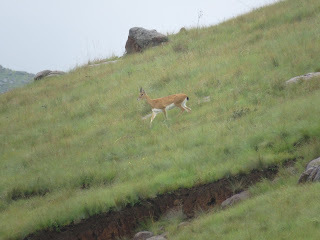 Poaching of antelope is a definite threat for the wildlife of the reserve. It happens mostly on the neighboring farms but affect the wildlife inside the reserve. Patrolling the reserve and surrounding areas is a challenge and Micca Khoza, the Officer In Charge, expressed his wish to establish overnight facilities for field rangers inside the reserve. There is an ongoing battle to eliminate alien plant species, most notably American Brambel. Black-backed jackals are threatening the Wattled cranes that breed here. The Drakensberg Region in general is a recognized tourism destination. In contrast, the location of the uMgeni Nature Reserve is traditionally known as an agricultural area rather than a tourist destination. 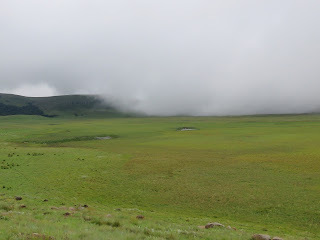 However, the high scenic values and other natural attributes of the nature reserve, together with its proximity to the Maloti Drakensberg World Heritage Site, clearly indicate a potential role for eco-tourism. This will have to be subject to the continued protection of the cranes, one of the primary purposes of the nature reserve. There is no accommodation or other facilities inside the reserve for visitors, and none are planned. At least not until the population of the Wattled Cranes has been stabilized. Visits to the reserve are currently restricted for research purposes only. This can be understood with the sensitive access through the surrounding farms.